Yesterday, I took her to her first protest rally - Unite Against the War on Women. She ate it up. 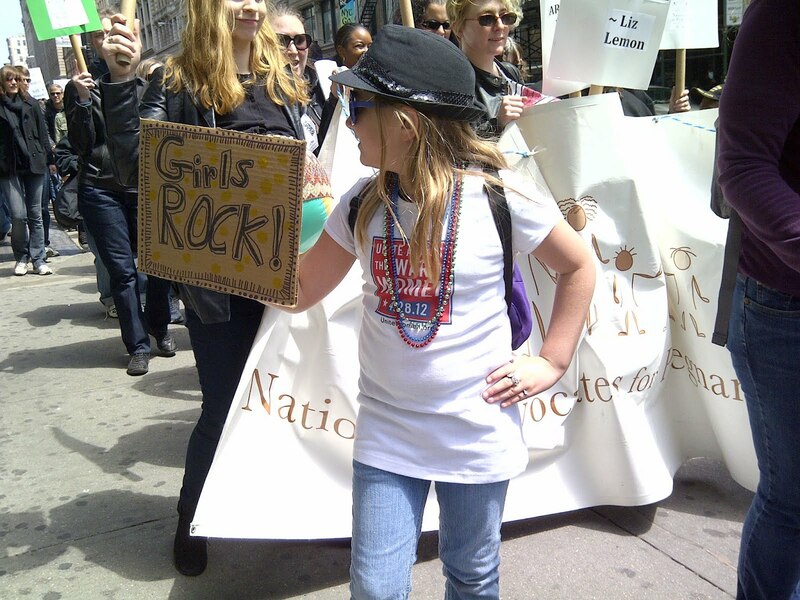 She was delighted to march, participate, hold up her sign, and wear the tee-shirt that a stranger gave her. And today? Today, for the first time, she rode her two-wheeler around and around the train station parking lot, all by herself. She even skinned both knees and one elbow, but got back on the bike and kept riding. This makes me smile from ear to shining ear. This puts a big smile on my face, too. She totally rocks. And so do you! 1. She is TOTALLY a badass. What a badass! You should be proud! Awesome. Talk about a great weekend! That's exactly what we need to raise our daughters to be--badasses. That is fantastic. All of it! Love it! You both are awesome.